Travelling Ted is a very valued member of our school community. He spends time each week with families from school and writes about his adventures in his diary. 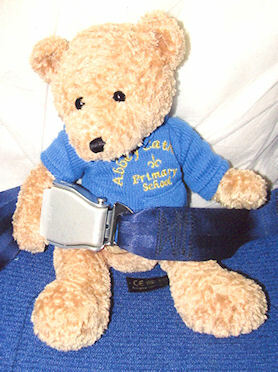 Travelling Ted likes to join children on exciting adventures both in and out of school. He loves to have his photograph taken and share all of his adventures with his friends. If you are going somewhere exciting or unusual, why not invite Travelling Ted along? As long as you write a report with a photograph for his web page - he'd love to join you. Travelling Ted was so lucky during February half term. His friend in Year 1 took him skiing! "I took Ted on holiday with me to France. 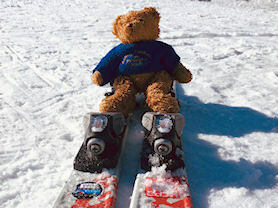 We went skiing every day and Ted came with me to the top of the mountains in the Alps. We went up to the top on a gondola. It was so fun! It was very cold but he had lots of fun. My ski instructor ate snails but Ted didn't fancy trying those. 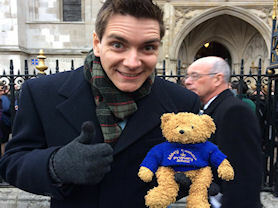 It was great having Ted with me in half term." I wonder where Ted will be off to next? Ted with a couple of friends. 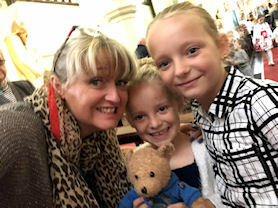 Travelling Ted has had a busy old time with lots of children in 1LH in the run up to Christmas. 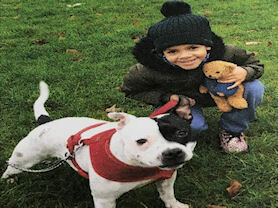 One friend taught him how to play the drums, he feasted on delicious chicken nuggets and chips and enjoyed a wonderful walk in the park with another furry creature. Ted was so busy with 1LH that he decided to have a well-deserved rest over the Christmas holidays. I wonder what he'll be up to in 2019? Ted at Beavers with a couple of Year 2 children. Ted has had a very busy October with 2CC! This month Ted loved going down the slides and in a ball pit before going to the circus with one friend. He thought the clown was so funny! Ted was really creative when he painted an amazing picture and helped his friend to do a jigsaw with 752 pieces in – Ted was really helpful at finding the corners. Last week, Ted was lucky enough to go along to Beavers with three children from Year 2. Ted has had such a busy October and he can’t wait for a week’s break. Who will he stay with next? Ted at Mass with Ms Tallon. 2KR have had a busy month welcoming Travelling Ted into their homes. In September Ted has been fed delicious breakfasts, listened to amazing bedtime stories and he’s been to two birthday parties! 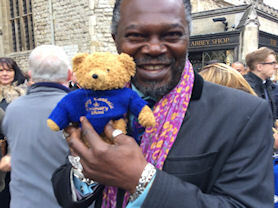 Ted was even lucky enough to meet Ms T at the Reception Welcome Mass. 2KR have loved having Ted come to stay this month and they say that Ted has helped them with their writing, too. 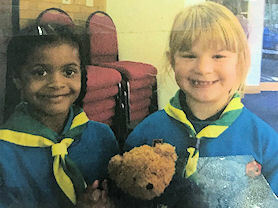 Book Club children travelled to Birmingham Town Hall to take part in a very exciting event that they had been preparing for in Book Club sessions after school. 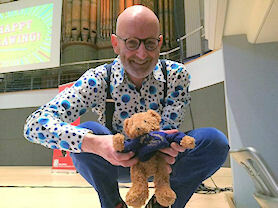 The Year 3 children took part in a draw-a-long with the famous illustrator, Nick Sharratt, as part of the Bournville Book Fest and they had a fantastic time! After creating some fantastic pieces of artwork, Book Club couldn't wait to meet the man who has created the artwork of characters such as Tracy Beaker and Vikings in the Supermarket, and Nick was more than happy to have a photo with our own Travelling Ted. What a brilliant day it was! 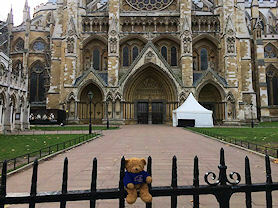 On Thursday 25th November Travelling Ted and Miss Haynes went to London for the day. First they went to Buckingham Palace where the Queen lives. and had a quick photo. 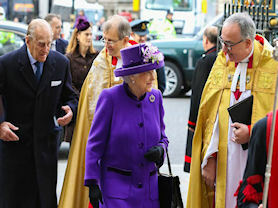 Then Miss Haynes and her brother (Mr H) visited Westminster Abbey for a very special event 'The Duke of Edinburgh Diamond Anniversary' service. 60 years ago, the Duke of Edinburgh started an Award Program for young people that aims and encourages teenagers to challenge themselves. Miss H and Mr H have completed the Award program and now Mr H is a young ambassador for the Duke of Edinburgh award. After a quick security check, Miss H and Ted went into the Abbey and got a seat on the front row! 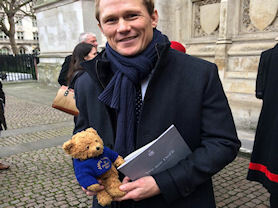 Whilst they waited for the service to begin they spotted some famous faces; Philip Schofield, Josh Lewsey, Jon Culshaw, The Weasley twins and many more! Miss H and Ted had to wait a little while but then ... Count and Countess of Wessex (Sophie and Edward) arrived! How exciting! Shortly after, lots of police cars and motorbikes arrived outside the Abbey followed by a very fancy car with a flag on top... It was the Queen's car! A few moments later, the Queen and the Duke of Edinburgh entered the Abbey and walked down the aisle (really close to Ted and Miss H)! Wow! As part of the special service, Mr H and some other ambassadors had to walk down the aisle, infront of over 2,000 people, to deliver the D of E charter to the High Altar. 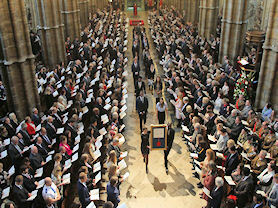 It was a beautiful service and everyone who attended left the Abbey feeling inspired. What an incredible day!